I was 39 when I was diagnosed with lymphoma, both the aggressive one and also low grade lymphoma. I had 6 doses of chemotherapy. Only when I started to recover from the treatment did I realize the full meaning of what having low grade lymphoma meant and the fact that I won’t hear the words ‘all clear’. However, while the low grade lymphoma is indolent (meaning lazy) I decided to do more outdoor activities, which I’ve always enjoyed but hadn’t done much of recently. 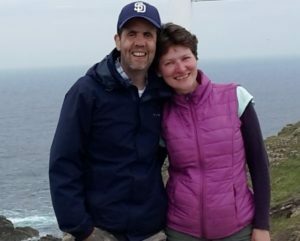 Learning about CCTA was just the right thing for me – not only that the charity supported our challenge but also all the encouragement my husband Martin and I got from them. 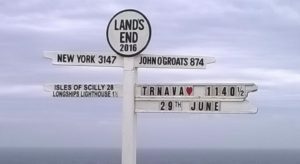 Our walking challenge in Cornwall was the best holiday I’ve ever had! I used to work as a cartographer in Southeast Asia and I like discovering new places. And yes, my husband agreed to do the walk with me, but then he is the one who told me about the charity in the first place! 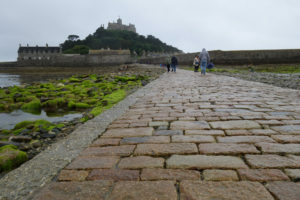 Our walk literally started at St Michael’s Mount. 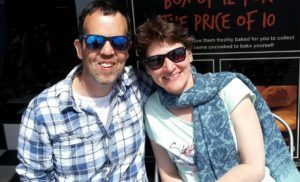 We came there by boat, spent a few hours discovering the island and once it was low tide, we walked back to the mainland and then on the beach to Penzance. It was a bit rainy but thankfully a smooth start to the challenge. Getting to Mousehole took us less time than we expected. Our good friends, Irene and Stephen, were meeting us there. They decided to come to Cornwall to help us in our challenge by preparing sandwiches for our hike each day. They then told us that it was their anniversary and they invited us to celebrate it with them – we had one of our very best freshly caught and cooked fish in this charming village! The real hike started here. It was around 10 miles with many steep ups and downs.The weather during the morning was getting worse, heavy showers with a strong wind forcing us to walk slower. To my surprise, I fully enjoyed it. It seemed there was only the roaring sea, the narrow path in the mist and us. I enjoyed the fact that I still could walk, whatever challenge faced us, and my body was able to handle it all, compared to where I was about a year ago. In the afternoon, the sky cleared and the sun came out. 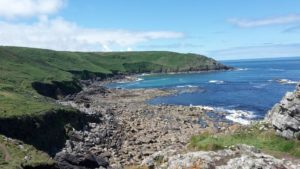 We came to St Loy’s Cove and we felt like we were in a different world. The beach was covered with huge boulders and we were only guessing our way forward. I was trying to embrace all the beauty that surrounded us. It seemed like around each corner the views were still more spectacular. Porthurcno, our destination at the end, was little explored as we had to rush so we’d be in time to see a play at the Minack Theatre. What better way to end our first hard hike! The beginning of this section was a bit daunting; the wind was back and the clouds were gathering again. 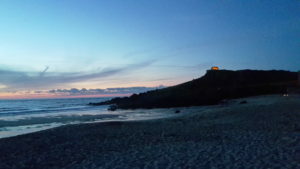 Thankfully, it got better and we enjoyed discovering Porthgwarra village and beyond. Sometimes we lost the path on top of the cliff, simply because there were many paths crossing each other. 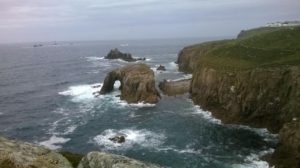 At one point we found ourselves near a huge, very steep hole made by miners in the past.We enjoyed Nanjizal beach and we often could see seals, but not dolphins – we’d been looking for them since the first day of the walk. 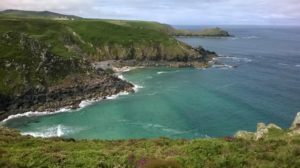 The path started smoothly at Whitesand Bay with two beautiful beaches and I was encouraged by seeing Cape Cornwall in the distance, our first half way break. However, the path gradually began to be strenuous and at some points using the OS map in our mobile was the only clear indicator on which way to continue. At Cape Cornwall we had a nice chat with a man who volunteers at the Look Out station. We learned more about the local area, birds, fish, boats and tankers. We could see one of the tankers in the distance and he was able to show us details about it on their PC – it was going to Londonderry and it was called Eva! Continuing our walk to Pendeen, the path gradually started to pass by the Cornwall Mining World Heritage Site. We were very tired by the time we arrived at Pendeen, and were delighted to stay in our lovely accommodation in a house that used to be a chapel. 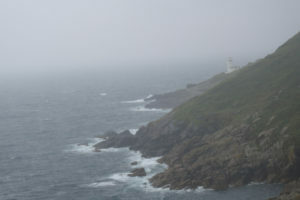 Starting at Pendeen Watch Lighthouse, we soon passed by the beautiful Portheras Cove. We still hadn’t tired of being fascinated by the beautiful views that kept changing. 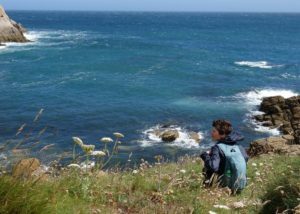 At one of the resting places we stopped, near Porthmoina Cove, we could watch climbers. We learned that climbers come there when the tide is low and as they climb up, the sea gradually fully floods the area where they started. 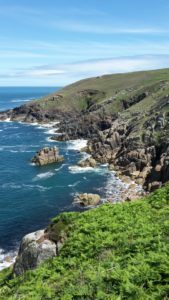 After another few miles of strenuous walking we came near to Gurnard’s Head. Though it isn’t a part of the SWCP, we decided to go and explore it a bit more. 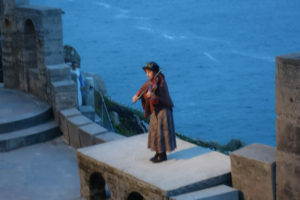 Then we hurried up on inland as the storm was coming and we were glad to get to our accommodation in Zennor just as the first big rain drops began to fall. Our last hike. We both were tired by this time. Despite the warm sunshine I found the first half of the walk difficult, but gradually it got better and I was able to enjoy it again. At Tregertheen cliff we had to scramble over rocks and then coming nearer to St Ives we gradually started to meet more tourists. We were stunned by the turquoise colour of the sea. 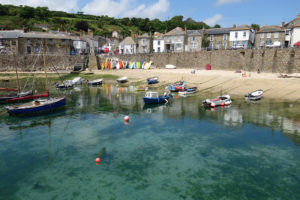 On this sunny day St Ives was showing us its ‘postcard face’. We were very happy, though tired when we arrived there. This town enchanted us. Our two days’ rest was well deserved and as a reward we could see dolphins, just by watching the sea from the window in our B&B! 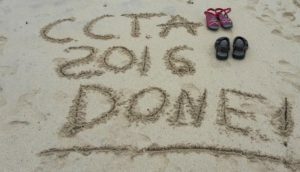 Thank you CCTA for helping us to build these special memories.